Sniper Strike: Special Ops’ gameplay reminds me of Kill Shot Bravo. The game has amazing graphics, intense missions and superb PvP sniper duels. There are three game modes: Campaign, Arena and a Player vs. Player mode. A campaign mission is further divided into shorter missions, whereas in arena, you lock horns with other players in rescue missions. PvP sniper mode pits you against a human opponent in various challenging maps. The game also has a clan system and an online leaderboard that displays rankings based on trophies earned in PvP matches, XP and weapon/gear/perk points. And now there’s a big new update that introduces a zombie event and several other exciting features. There are various ways to get rewards. You get free chests that keep dropping every 4 hours, crates from campaign wins and PvP league rewards. Follow our tips and strategies to get gear and perk cards, win sniper matches and get more cash. On your campaign screen you will see a checklist displaying the main mission and two more sub-quests. You get more cash when you complete the main mission, but there’s no harm in finishing the other two tasks to get some bonus in-game money. Keep an eye on such a checklist and complete all three missions to get more cash. Sub-quests range from getting two or more headshots, killing enemies in two shots or less and several other challenging tasks. You can replay the same mission (will cost energy) if you have missed a quest or two. Remember the money you accumulate will help you buy new weapons, upgrade parts and customize your character. In rifle missions, you will come across multiple incoming enemies. In such a situation, you have no option but to use the slo-mo power. But wait, there might be an explosive barrel somewhere around. If you spot one, shoot it when there are several enemies near it. Normally, explosives can be found in missions where multiple enemies are present. You will also find barrels in arena missions. While thermal vision can let you see unarmored areas on an armored enemy, you can still take him out without using this boost. All you have to do is zoom in to his face and tap the shoot button to eliminate him. Usually an armored gunman’s face isn’t covered and so it can be an easy target. But if the gunman is fully armored, then you might consider using the thermal vision to know what areas can be targeted with your sniper rifle. I am not talking about the slo-mo power-up here, but an in-game scene, where everything slows down for a few seconds soon after you blow up a door. Take full advantage of such slo-mo scenes to get double kills. Using your shotgun, you can easily eliminate incoming enemies and it will take a few bullets to get rid of them even before they react. 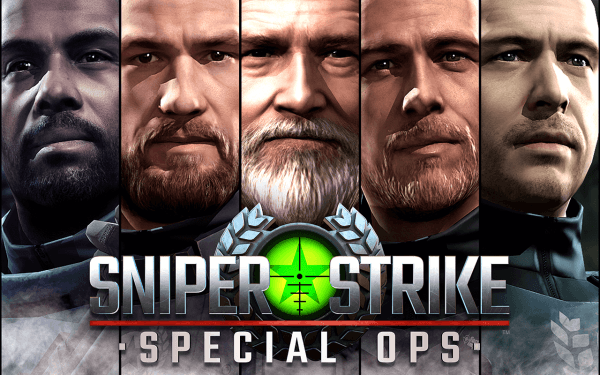 There are two major power-ups in Sniper Strike: Special Ops – Armor Piercing and Slow Mo. The first power-up lets you eliminate an armored enemy by targeting any part of his body. The second power-up slows down movement, allowing you to kill fast-moving enemies with ease. Both power-ups can be very useful in finishing a campaign mission, but use them sparingly. You can use a power-up in critical missions, such as a boss mission. A slow-mo power-up can be very useful in such missions. Take the example of the “Kill Kain” mission. You will have to take down incoming bomber squad and the slow mo power-up works perfectly in such situations as you would want to kill as many enemies as possible before they blow themselves up. Sniper Strike’s synchronous PVP matches can be pretty frustrating if you are not quick to spot your opponent. When the game starts, try not to zoom in too much. Move the zoom slider a little bit just to bring your scope and then follow the direction of the arrow until you spot your target. Also keep an eye on your opponent’s scope glint. Arrow direction and enemy’s lens shine will help you find your opponent faster. In PvP matches, players will be pitted against each other in map and the one who snipes down first will win the game. The game has a best-of-three player vs. player mode and the one who wins two out of three games will win the match. You will receive chests on winning a PvP battle. PVP chests may contain gear/perk cards and cash. Gear cards provide certain buffs that can be useful in your missions. There are various gear cards such as goggles, vests, suits and knee pads. Upon equipping a gear card, you get certain buffs, such as cash bonuses, extra clan points, increase in PvP trophies, increase in pistol damage etc. You also get gear points when you equip a new card or upgrade it. You can get gear cards from free crates, which can be seen on the bottom of your home screen. You will also get them from reward chests received from PvP matches. You get better cards in PvP leagues. To find your place in a league, you will have to keep winning PvP matches and earn trophies. For example: If you receive 400 trophies, you will be placed in league 1, and the rewards are 14 Gear/Perk cards with 1 guaranteed rare card. Do remember that losing a match will deduct a few trophies from your total trophy count. Perk cards provide battle benefits such as critical hit chance, chance to get bonus cash for multi kills, chance that headshots will give extra bonus cash etc. You will get perk cards from free chests, PVP chests and PvP league chests. To upgrade perks, you will require duplicate cards. An upgrade boosts the chances of getting critical hits, bonus cash, instant tags, damage reduction, instant reloads, etc. You can equip more than one card to your character. To do this you will have to unlock perk slots using gear points, which you earn when you equip a gear card to your avatar or upgrade it. To get a list of perks and gear card, tap “Campaign” on your home screen and then tap the “Customize” button. Just like other mobile sniper games, Special Ops requires players to upgrade crucial weapon parts before a campaign mission. A part upgrade requires cash, so make sure you have accumulated enough cash before you start improving parts. Surely you can skip an upgrade and go for the kill, but your shots may not be accurate, especially if it’s a sniper mission. You can try if there’s a skip option and start a mission without that critical upgrade. There’s no harm as you can replay if you fail. But it’s recommended to upgrade parts when a suggestion pops up on your screen.